Flak jackets would probably have been a best-seller at Pittodrie this season. Critics from all corners took their pot-shots at Aberdeen for their slow star – exacerbated by Hearts’ impressive early form – and their struggles in front of goal. Shots incoming were more frequent than those from their own players. However, reaching a cup final with last month’s 1-0 victory over Rangers at Hampden –the start of a four-game winning run – helped to silence some of the doubters. The 3-0 defeat at Motherwell last Saturday has halted some of that momentum but the Dons head to the national stadium to face holders Celtic in the League Cup final on Sunday knowing they are only a game away from lifting a trophy. 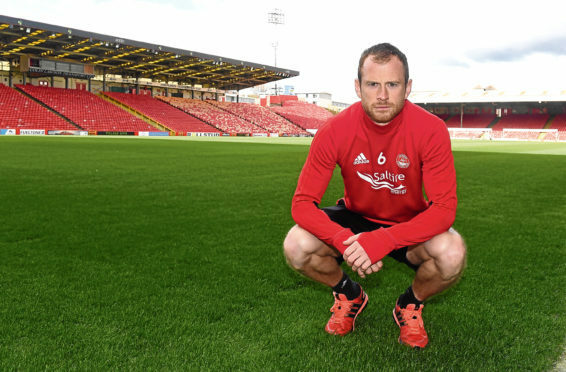 For Dons defender Mark Reynolds, who has been away from the limelight due to a cruciate ligament injury sustained in pre-season, the early-season criticism was unjustified. He said: “At the start of the season we were getting battered from all corners – ‘Aberdeen have blew up’, ‘Aberdeen aren’t this or that’, ‘these others have arrived and it’s finally their time’. “But we’re still there or there abouts in the league – the top six is so tight – and we’re in the final of a cup. “For us to have been so negative and everyone be doom and gloom, we’re still doing very well. It comes with that level of expectation that we’ve created. 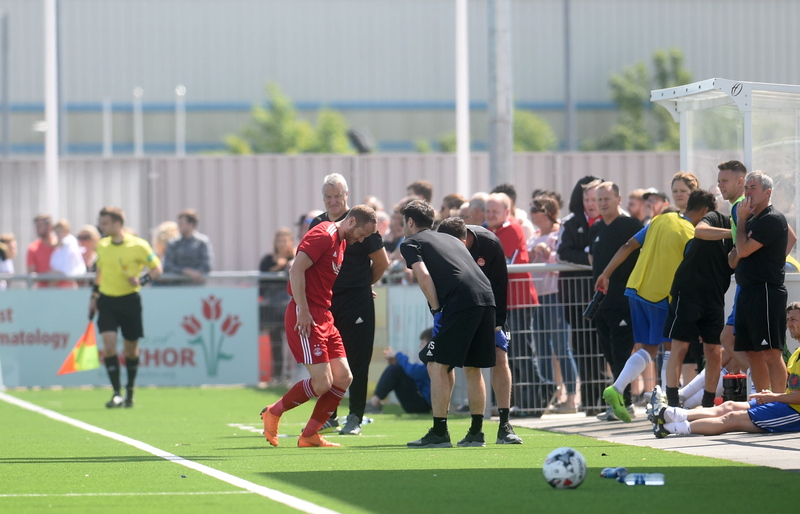 Mark Reynolds limps out of the pre-season friendly with Cove Rangers. As one of the senior pros brought in at the tail-end of Craig Brown’s reign, Reynolds has experienced the days of missing out on top-six football and watching cup finals on television. He picked up a winner’s medal in 2014 when the Dons beat Caley Thistle in the League Cup final, which ended a 19-year wait for a trophy. He said: “I don’t think you’re ever due silverware. We’ve not played as well as we could have but the manager always says cup competitions are all about getting to semi-finals and finals. We’ve put ourselves 90 minutes away from winning a cup and that’s all you can ask. In cup semi-finals and finals, sometimes a manager will need to say ‘if they have an off-day, we have a chance’. The former Motherwell defender has also seen the other side of the coin, playing in the 2-1 defeat by Celtic in the Scottish Cup final last year. Even with the agony of Tom Rogic’s late winner, Reynolds would love to be part of another Dons winning squad. While Reynolds’ injury will preclude any playing role, the 31-year-old will still have his voice heard. He added: “It’s a very close changing-room and the manager knows he’s got boys that have done it before in big games. “We’ve been to cup finals and competed with Celtic before so it’s about taking your chance.